A middle school boy declined that offer a few years ago when I was talking about economics at a local school. But he lost out on an incredible deal. The silver content of the half dollar I offered him was worth eighty times its face value. I don’t write often on economics, but all the talk in recent months about the fiscal cliff, the sequester, and so on got me thinking about that economics presentation I made a few years ago. We’re debating these issues nationally because principles of biblical stewardship are not governing public economic policy. Many voters are complicit in this, even many Christian voters. Yet good economic thinking flows from what we believe about God. The consequences are not mere politics. It’s about loving God and our neighbor. Labor, thrift, wise investment, long-term planning, and generosity are theological principles rooted in God’s created order. If the state encourages their exercise, financial blessings are widespread, providing ample resources for gospel ministry. Just taxes, financial responsibility, and the proper use of authority allow people to retain the fruit of their labor. People living under economic liberty better reflect God’s image as we manifest the glory of His creation via the re-creation of work. Our economics will be grounded either in Bible-centered theology or in humanistic thinking. Only a true faith that applies God’s Word to everything—including economics—will lead to the revival and reformation our culture needs so badly. For more than forty years, by God’s grace and the support of friends like you, Ligonier Ministries has helped Christians learn and apply Scripture’s teaching in every arena, including economics. 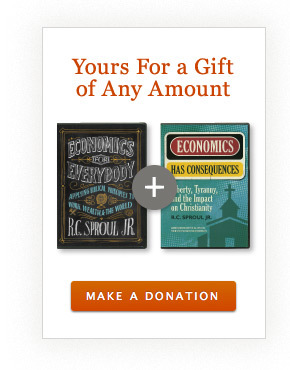 To help you develop and fruitfully apply a comprehensive biblical view of economics, we are offering a special resource package combining our highly acclaimed study series, Economics for Everybody, and a two hour documentary called Economics Has Consequences. In this 12-part DVD teaching series and documentary, Dr. R.C. Sproul Jr. explores the intersection of theology and economics, explaining Scripture’s basic economic principles and their ramifications. This series takes complex economic topics and explains them in insightful, entertaining, and unconventional ways. It’s yours for a gift of any amount to Ligonier. Your support will help us teach God’s word to as many people as possible around the world, and you will receive resources to keep and share with others. Will you help Ligonier train believers to apply Scripture in every area of life? Thank you. Note: Offer expires 07/31/13. Please allow up to 6 weeks for delivery after your gift is processed. Contributions are tax-deductible as allowed by law. For federal income tax purposes, the deductible portion of your charitable contribution is limited to the excess of the money contributed over the value of the goods provided. Our good faith estimate of the value of this resource is $15. Offer valid in U.S. and Canada only. Thank you for your support.